Welcome to the latest edition of the Children of Prisoners Europe newsletter. Not only is today Universal Children’s Day, but this year also marks the 25th anniversary of the UN Convention on the Rights of the Child. Child rights organisations are mobilising themselves all around the world to mark the occasion and to underline the importance of working together to realise, fulfil and protect the rights of children across the globe. With the coming into force of the OP3 earlier this year, granting children the right to make complaints directly to the United Nations Committee on the Rights of the Child, 2014 marks a momentous year for children’s rights across the world. The Children of Prisoners Europe (COPE) network, with its twenty-four member organisations in fourteen European countries has achieved much over the past twelve months. With the continued devoted efforts of our members working to realise the rights of children of imprisoned parents through support services in the field, this has been a busy year for us. Follow the links provided to learn more, and please share the information among your own network and contacts. The more we spread the word, the more recognition we can achieve on behalf of the estimated one million children of imprisoned parents in Europe. Click on the image below to read the letter in full. In October 2014, Children of Prisoners Europe welcomed UK organisation Partners of Prisoners and Families Support Group (POPS) as an applicant member of the network. Both organisations worked very successfully together on the EU FP7 Framework Coping project between 2010 and 2013; this further partnership promises to be interesting and mutually beneficial. COPE’s Norwegian member, For Fangers Pårørende (FFP), offers support and advice to families and friends of prisoners and strives for transparency and improved conditions for their families. In 2014, FFP staff visited several prisons across the country to meet with prisoners, present the work they do for families, and discuss the importance of maintaining family ties during incarceration. Outdoor spaces to provide a more relaxed atmosphere for families during visits, a longstanding aim of the NGO, have been established in two of these prisons. This year FFP received funding for their “Minority Project” which aims to extend their services to families of ethnic minority backgrounds, to gather more information about the specific needs of this group, and to raise awareness on these issues within the correctional services. FFP has also been actively lobbying for a Children’s Officers scheme to be made mandatory in all prisons—a goal which should be attained by the end of the year—and the NGO has been invited to speak at the first meeting of these Children's Officers from all over Norway in Trondheim this month. 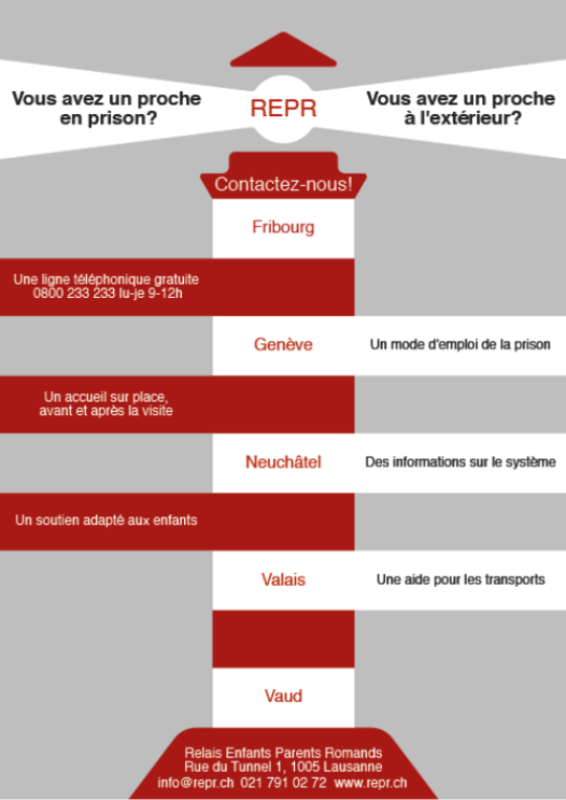 The Relais Enfants Parents Romands (REPR), a full member of COPE, supports families of prisoners by welcoming them, listening to their concerns, and offering information and advice at nine prisons in western Switzerland. The charity also offers a shuttle service for children from the train station to two prisons. REPR holds support groups (“Creative Workshops”) once a month in four prisons for those children who are accompanied by social and educational workers to visit their imprisoned parent. 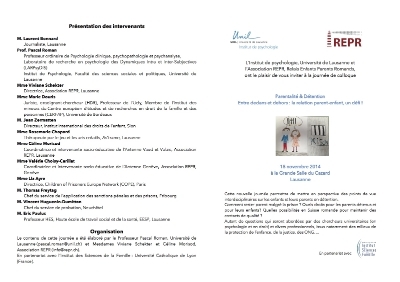 REPR also provides psychological support and information for children affected by parental imprisonment and offers support not only during visits but also by telephone and email, as well as through holiday parties in several prisons throughout French-speaking Switzerland. REPR raises awareness for families of prisoners through specialised training of detention officers and presentations to university students studying law, criminology and public health. 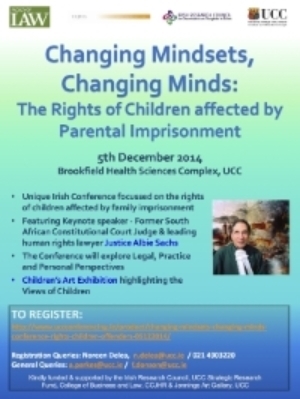 REPR also organised a conference called Parenthood and Detention on 18 November 2014 (see below) and is presenting at “General States of Detention and Probation” today, 20 November. The latter will focus on reflection and exchange around the life of prisoners, resettlement and the prevention of reoffending. The Ombudsman’s Office for Children in Croatia, a full member of the COPE network and represented by the Deputy Ombudsman for Children, Maja Gabelica Šupljika, has been working to improve the situation of children of imprisoned parents since 2006. This year, the Ombudsman’s Office dealt with eleven specific cases concerning violations of the rights of children of prisoners and they have made special recommendations to both the prison system and social welfare system for more efficient protection of these children. Earlier this year, the Ombudsman’s Office encouraged the prison system to mark the first week in June as Prisoners' Children Week in order to raise awareness about this vulnerable group by conducting activities with children visiting their parents in prison. During the June 2014 Prisoners’ Children Week, the Ombudsman's Office made a presentation at a conference organised by the “Most” ("Bridge"), an NGO based in Split entitled “Children in the Prison System”. On 21 March 2014, for the first time in Europe, a Memorandum of Understanding was signed by the Italian Ministry of Justice, the Ombudsman for Childhood and Adolescence and Bambinisenzasbarre ONLUS, Italian member of the Children of Prisoners Europe network, on behalf of the estimated 100,000 children visiting their parents in Italian prisons. The charter is applicable across all Italian prisons and represents a significant milestone for the work of the Italian charity. Read more about the Memorandum and its articles here. In July 2014, Bambinisenzasbarre began an artistic project involving children and their imprisoned fathers in Opera prison, Milan. Entitled “The Dinosaur and the Policeman”, and supported by the Alta Mane Italia Foundation, the one-year project is based around painting being a valuable tool for children as it allows them to express artistically what they are often unable to communicate verbally. Bambinisenzasbarre have also been involved in various training sessions in the past two months and, to celebrate Human Rights Day on 10 December this year, the Italian NGO is organising an event at the Senate in Rome to launch the second edition of “The Right to be a Human Being” of The Human Rights Anthology. Interested in becoming a member of the Children of Prisoners Europe (COPE) network? UK network member Pact has teamed up with a group of young people between the ages of 13 and 17 who have experienced the imprisonment of a family member, to find out what changes they would like to see in the Criminal Justice System and what Pact can do to help make their voices heard. 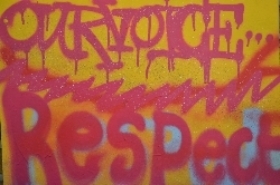 The result of a series of workshops led by 21-year-old Ebony Brown, this charter, 'Our Voice', is a clear, accessible document detailing the various rights these young people want to see fulfilled. In: Women and Children as Victims and Offenders: Background—Prevention—Reintegration. Suggestions for Succeeding Generations. 2015 will see a new book chapter published on children of imprisoned parents. Co-authored by R. Asiminei, L. Ayre, A. Berman, K. Christmann, L. Foca, C. Gavriluta, M. Manby, K. Philbrick, O. Robertson and K. Sharratt, the book chapter is entitled: Children of prisoners: Their situation and role in long-term crime prevention. Abstract: Studies suggest that maintaining family ties can help reduce the likelihood of reoffending, and that while parental imprisonment can increase a child’s likelihood to offend, positive responses to the situation can aid the children’s wellbeing, attitude and attainment. Drawing on findings from the recently completed EU-funded COPING Project on the mental health of children of prisoners, this chapter explores the factors that aid a child’s ability to cope with parental imprisonment and the actions that different stakeholders can take to support them. COPE was honoured to be included in the European Network of Ombudsmen for Children (ENOC) conference in Edinburgh in October. The conference was based on the theme of austerity, and included several moving video clips on the topic created by young people across Europe showing how austerity affects them. Richard Holloway, a former bishop, exhorted delegates to change the world by strengthening the weak, to “spend thousands to save millions”, with a paradigm shift of putting children at the centre and giving them a cultural and spiritual life so they develop a resilience that helps them make good choices, and realise their full potential. Valuable inputs from the Council of Europe and the European Commission described the policy landscape and distinguished academics considered impacts of austerity from legal, sociological and political perspectives. The dedicated work of individual ombudspersons from both Croatia and Italy, focussing on children of prisoners, was showcased (and is detailed above). Kate Philbrick, former president of COPE, spoke about how austerity can have a particularly strong impact on children of imprisoned parents. ENOC members should now have an increased awareness of the issues concerning children of prisoners; COPE members could follow this up nationally. Relais Enfants Parents Romands (REPR) director Viviane Schekter opened “Parenthood and Detention, inside and out: the parent-child bond, a challenge”, an interdisciplinary conference it organised in Lausanne on 18 November, by emphasising the need for further development of support initiatives for imprisoned parents and increased coordination among the various sectors involved. The conference focussed on the issues surrounding parenting in prison, including support initiatives for imprisoned parents, better coordination among the various sectors involved and increased awareness among imprisoned parents of their rights. Speakers included Professors Marie Douris of Université Catholique de Lyon, Pascal Roman of the University of Lausanne and Jean Zermatten, director of the Institut International des Droits de l'Enfant and former chair of the UN Committee on the Rights of the Child. REPR also presented its pioneering support initiatives for imprisoned parents and their children. The good practice currently being carried out to support parents and children among the member organisations of the COPE network was presented by director Liz Ayre, who highlighted COPE’s priorities, ethical framework and perspectives. Roundtable panel members stressed the need for the important roles that prisoners' families play to be recognised from the onset of the prison sentence, and not only towards the end of the sentence when resettlement issues are addressed. UCC School of Law is hosting an international interdisciplinary conference highlighting the rights of children affected by family imprisonment. The aim of this innovative event is to bring together key professionals and researchers as well as those actively working in this area to share best practice and knowledge. The conference is organised by Aisling Parkes and Fiona Donson (director of St. Nicholas Trust, who became a full member of the COPE network this year). Keynote speakers will include the world renowned Justice Albie Sachs, a former Judge from the South African Constitutional Court. Other international experts in this area such as Ben Raikes, Senior Lecturer in Social Work at the University of Huddersfield and Lucy Gampell, president of Children of Prisoners Europe, will share their specialist knowledge. This event will also provide a platform for the NGO sector as well as those directly affected by family imprisonment. 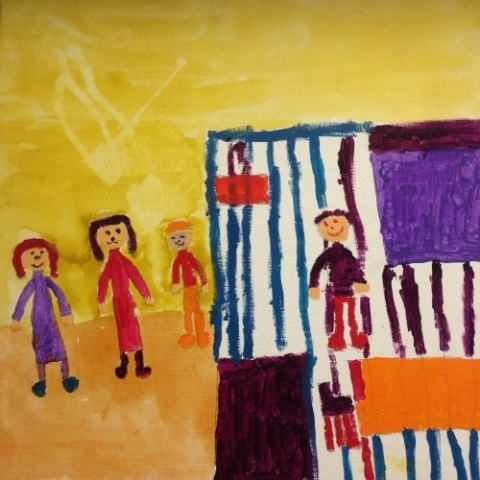 A unique children’s art exhibition, to be hosted in the Jennings Art Gallery UCC, will provide attendees with a critical insight into the views of children and young people affected by imprisonment in Ireland. Registration 40€. The Fédération des Relais Enfants Parents would like to invite you to participate in a day of reflection and discussion on the founding principles and ethical limitations of supporting of child-parent relationships. This forum is being organised by the federation to mark its 20th anniversary, at the Centre Culturel le Beffroi, Montrouge. Following the ethical questions posed and discussed, there will be a commentary by Mr. Pierre Joxe, former Minister and lawyer and an expert panel discussion on the topic. The conference will be opened with a performance of La rencontre ("the Encounter"), interpreted by Raissa Bedjaoui of Théâtre Fauve. Children of Prisoners Europe would like to thank the Bernard van Leer Foundation for their continued and kind support of the network. 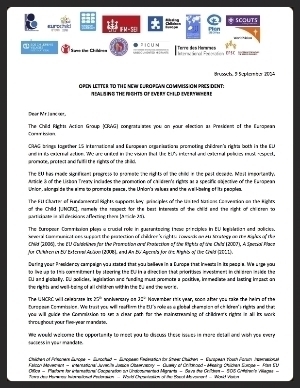 Copyright © 2014 Children of Prisoners Europe, All rights reserved.